Before you visit the Vatican Museum, you need a plan. Whether it's a detailed battle plan or a simple list of "must see" items, walking into the Vatican Museum without some sort of plan will result in hours spent wandering aimlessly from room to room, wondering how anyone could possibly say they've "done" the Museum without spending an actual lifetime there! When we visited the Museum in July, our plan consisted of nothing more than making sure we saw the Sistine Chapel. But before you ever reach the Sistine Chapel,* you walk through nearly seven kilometers worth of galleries featuring some of the world's finest paintings, sculptures, ancient artifacts, mummies from Egypt, and jewelry - all spanning from ancient civilizations to modern creations. Although we knew the Museum was extensive, I don't think it really sank in just how much so until we showed up after a morning in the Basilica. In retrospect, I wish I had compiled a battle plan instead of a "let's just show up and see what's what" kind of plan! The Raphael Rooms ~ Call me incredibly clueless, but I had no idea there was so much of Raphael at the Vatican Museum (obviously, I've forgotten all the art history I learned in high school). I could've spent hours in the Raphael Rooms, mouth agape and completely engulfed in the School of Athens or the masterful Battle of Milvian Bridge (a Raphael design painted by Giulio Romano). After seeing these paintings peer out at me through school textbooks and tv documentaries countless times, I couldn't believe they were right in front of me. Gallery of Maps ~ What a hidden gem! These 16th century frescoes by Ignazio Danti depict the entirety of the Italian peninsula. We loved looking for familiar-sounding towns and cities of those we had just visited and those that still remain on our bucket list. Sistine Chapel ~ By far, the Sistine Chapel was the apex of our Museum visit - and yet, it wasn't the experience I wanted. Sadly, no photos are allowed (but many misbehaving tourists were snapping them anyway). We spent at least 40 minutes in the Chapel, listening to our audio guide's explanation and descriptions of all the artwork. Michelangelo's artistry draws people from all over the world, but unfortunately the hordes of tourists detract from the experience. Instead of being able to quietly ponder on the Biblical stories and lessons behind the art, you are being bumped by tourists surreptitiously trying to sneak a picture. Rather than hearing Gregorian chants or hymns, you are serenaded by a Museum employee telling you, "Silencio. No photos," in at least three or four languages. Perhaps you can experience a more reverent atmosphere in the off-season, but there was none to be had in July. Caravaggio, Titian, Bellini.... yeah, they're all there. I couldn't possibly cover all these masterpieces in one post. (Future post, maybe?) By all means, buy yourself a ticket to Rome and go marvel over these pieces in person yourself!!! Buy your tickets ahead of time, especially if you're planning to visit in the busy tourist season! Although it will cost an additional 4 euros a ticket buying in advance, it translates into saving precious time when you can skip the long lines of people just waiting to buy their tickets! This pup wants to know when you're coming to visit him! Have you been to the Vatican Museum? What were your favorite galleries? Accessibility: Currently, the Museum is not immediately near a Metro line. We took Line A to the Ottaviano - "San Pietro" station and walked south on Via Ottaviano for 2 blocks, then a right onto Via Germanico for 2 blocks, at which point the walls of the Vatican are directly in front of you. Follow the wall to the right (eventually turning onto Via Vaticano - as if that isn't a clear indication of where you're going! ), and it will bring you to the Museum entrance. It was about a 10-15 minute walk. Tips: Unless you're planning on queuing up at least 30 minutes before the doors open at 9am, do yourself a favor and buy your tickets online before you ever leave home. You can reserve a specific entry time (we were able to enter the museum before our allotted time) and having that ticket will allow you to bypass the excessively long lines! We chose to rent an audio guide, which was very helpful for the artifacts that piqued our interest. 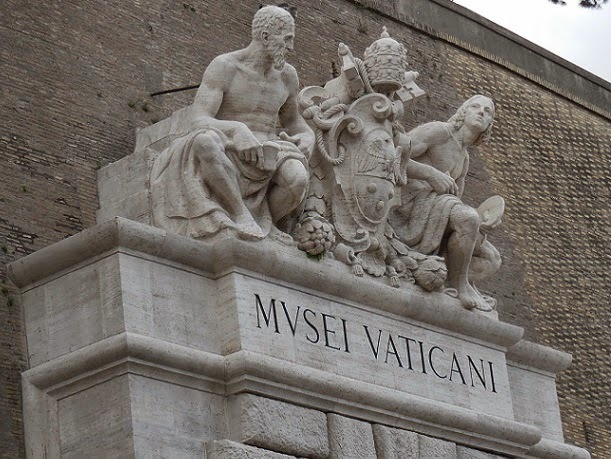 Just like with visiting the Basilica, you will have to go through metal detectors and other security so make sure you don't accidentally bring any prohibited items with you. * There were signs indicating how to bypass or cut through various galleries in order to get to the Sistine Chapel faster. This would be very helpful for visitors on a strict time schedule or those who have no interest in anything but the Chapel. 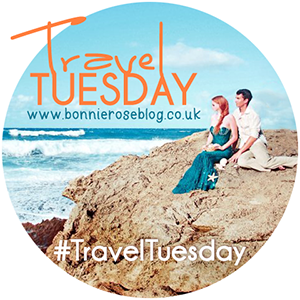 Linking up with Bonnie & other travel bloggers for #TravelTuesday! I loved the Vatican museum! I was with a private tour group and they kind of rushed us through so we could get to the Sistine Chapel before it got dark, so I'm dying to go back and spend some quality time there! You and me both!!! Maybe in the off season!